"My First Day of VPK"
Your child will soon be starting their very first day of Voluntary Prekindergarten (VPK). This is a huge milestone worth celebrating! No doubt, you’ll be taking a few pictures on your child’s first day of VPK. 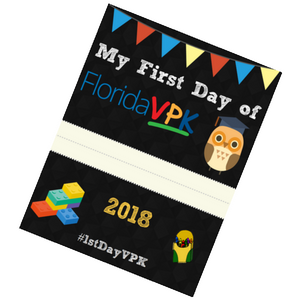 You can make the occasion even more memorable by downloading and printing our “My First Day of VPK” flyer. Then, use #1stDayVPK when posting your photos on social media. The Early Learning Coalition of Palm Beach County, Inc. will be sharing #1stDayVPK tagged pictures on our social media through the beginning of September this 2018–2019 school year. 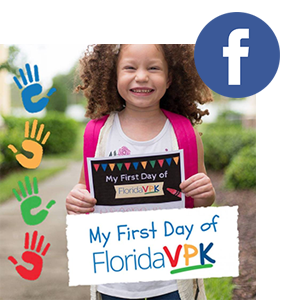 You can follow along using #1stDayVPK on Facebook and Twitter! You can also use our special Facebook photo frame to commemorate your child's big day! To add the frame, click here and search for "My First Day of VPK." Adjust the frame to your liking and then click "Use as Profile Picture." We are excited to see all of your #1stDayVPK pictures and we hope you and your family enjoy all the new adventures in this coming year! Arrive early and allow enough time for your child to become familiar with their classroom and teacher before you say goodbye. Plan the night before and visualize the day. Help your child know what to expect and let them imagine how their first day will go. Don’t try and sneak away to prevent a meltdown. Accept that saying goodbye will be emotional, but remind her that she'll be safe and will have fun at her new school. Even if she runs off to play with friends, make sure to let her know that you are leaving. Practice getting ready in the morning, packing lunch and even driving to the school before the first day to help your child get familiar with this new routine. Let your child know how proud you are of him even before he takes his first step into the classroom.